Review It must sting Samsung that the criticism most often levelled at the manufacturer is that its flagship Galaxy S devices feel cheap and plasticky. And for once the criticism is not just coming from Apple fans. The Galaxy S3, S4 and S5 have all felt a bit too toy-like for their price tag. Technically impressive they may have been, but the build quality was, and is, too Fisher Price. 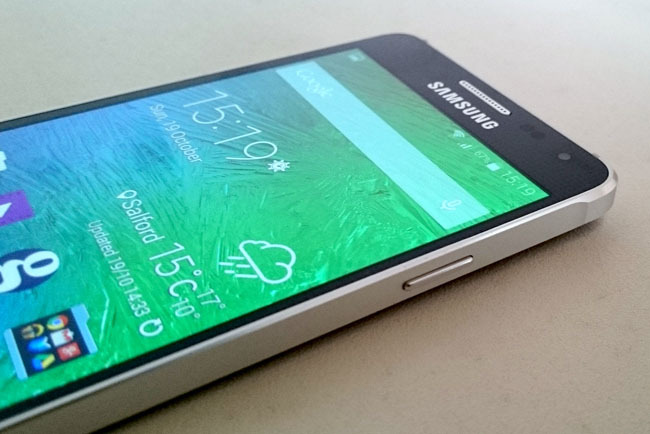 The new Galaxy Alpha is Samsung’s counterpunch. It is a phone that tries to put aesthetics and build quality on an equal footing with the length of the specification sheet. Now who else does that? Oh yes. Surprisingly, at first glance, the Alpha looks rather a lot like its Galaxy stablemates. But once you get the thing in your hand, the coin soon drops. Gone is the creaky, plastic case to be replaced by a much more solid, stylish and expensive-feeling affair, complete with an exposed, chamfered metal band running along the circumference of the handset. That metal band flares at each corner into what look like little bumpers which gives the design a bit of pizazz and at the same time makes the Alpha easier to grip. I have to say, though, that while the Alpha is certainly the smartest, most solid and aesthetically desirable device to roll out of a Samsung factory, it’s still not as inherently as impressive a piece of design or manufacture as the Apple iPhone 6 or HTC’s M8 One. It's very good, but it’s not great or groundbreaking. The metal band is only interrupted by the power and volume controls (also made from metal), the 3.5mm audio jack at the top and a microUSB port and speaker grille at the bottom. 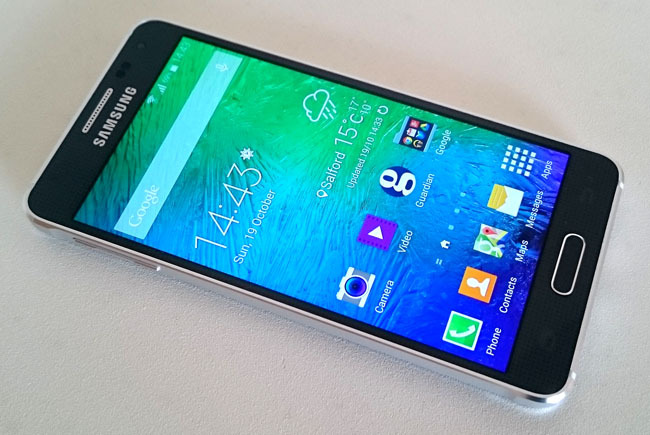 There are no covers or flaps to worry about because, unlike the Galaxy S5, the Alpha is in no way dust or waterproof. Drop this sucker into the surf and you are truly up the creek without a rowing implement. The front of the Alpha is a simple sheet of toughened glass punctured only by the traditional Samsung home button. The back, however, is made from plastic. But that is a trade-off I’m happy to live with because it makes the Alpha less slippery and it unclips to give access to the SIM card and removable battery. Oddly for a Samsung smartmobe, there’s no memory card slot so you have to make do with the built-in 32GB. Or rather 32GB minus the 6.1GB the system takes up.